Monday morning brought with it the joyous arrival of three little eaglets, nestled comfortably in their cozy nest, under the watchful gaze of their Eagle foster mother or father (Calder never really made that clear) in Belltown's Olympic Sculpture Park. The eaglets' birth parent(s) - we'll assume father(s) - were nowhere to be found, leaving behind only a small sign which read Eaglets - Mixed Media - 2007 and the initials pdl, accompanied by the ASL symbols for each letter. This stylized attribution leads the Bent to believe local performance art trio Jason Puccinelli, Jed Dunkerley, and Greg Lundgren, also known collectively as Vital 5 Productions, are responsible for this gift of life. But one can't be sure. Just last week, the trio, decked out in berets, were in Tacoma impersonating collaborative artists SuttonBeresCuller as they anonymously installed their own Ship in A Bottle at TAM. But that's a different story. It's entirely possible that SBC sired the Eaglets and are impersonating-in-absentia (is that possible?) the apparently attributed acronymic parents. DNA sampling doesn't quite work in this really-mixed-media world. Maybe we could check for paint chips under fingernails to find out who's parenting, or performing, whom. UPDATE: 02/20 - after being buffeted about and knocked from their nest by recent wind and rain, the eaglets have been moved indoors and are under the foster care of SAM conservators. Seattle is pretty lame at lots of stuff (public transportation decisions, for example) but we do a good job with mysterious outside art objects. Glad we're good at something. I just about died of cuteness when I saw those special little guys yesterday. I wish I could feed them little art-food or something! Love the eaglets. Love your take on them. Thanks to the artist(s) who created them. Is the slog using your pic, belltown? Hi jseattle - yes. I just saw a big Slog run in my log, thanks to "link police", and left an inquiring comment for Angela. I don't understand what excuses Sloggers from due diligence. Maybe she'll explain. Let's call one of them Stephen, Jr. Call the bomb squad! Why hasn't anyone called the bomb squad! This could be TERRARISM! Won't someone think of the children? This story continues to resonate with me, for some reason. It is wonderful-ness in action. Generally, I don't like people. But this kind of thing gives me hope. Laughing out loud b/f coffee is always good! Thanks for reporting this impt. news ... perhaps this is another form of hidden talent? I don't get art like that. 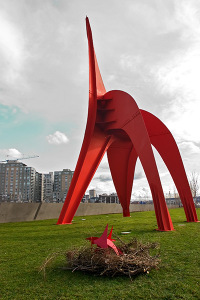 Where is Calder's Eagle and what are its dimensions? I'm doing a project on it. Wow, its wonderful in action. This kind of thing gives me hope. I'm surprised you got permission to use so much of that interview here. What an idea, Great tips, I would like to join your blog anyway. I think its a great idea. This is a really very articulate opinion. Not every visitor would look at it from that angle, the way you just did. I am glad that there is so much information about this subject that have been uncovered and you did it so well, with true class. If wanted to know more about e cigarette, than by all means come in and check our stuff. Keep this thing going! Love your story! A well made craft by a genuine artist.